All year we work hard to amplify your voice, creating the political pressure, political will, and political cover to create an environment to change the culture on our streets. Just last week, Bike Union executive director Becca Wolfson co-wrote this Boston Globe Op-Ed with Boston City Councilor Michelle Wu and Cambridge Vice-Mayor Jan Devereux, on the urgency of making our streets safer to bike. With the international day of giving, Giving Tuesday, in one week, we ask that you give early to help us make the vision of a world-class biking city a reality in Boston. We know crashes can be prevented through better design that makes our city streets safer and more comfortable on which to ride. We’re optimistic that more change is on the way, since our advocacy—YOUR advocacy—moved Mayor Walsh to add 20 new staff to the Boston Transportation Department and increase the department’s budget this past June. 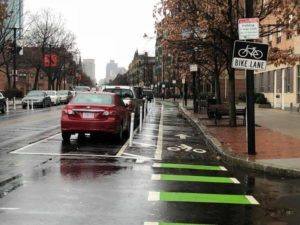 We’re optimistic that it will lead to more change like new protected bike lanes on Columbus Ave., which shield thousands of people daily as they ride downtown from the southwest corridor. However, we know as well as you that we can’t rely on optimism alone. We must do more to bring an expansive, connected bike network to Boston that stretches into every neighborhood in the region. We need you to give today to ensure we are well equipped to advance our work. Your dollars will be immediately put to use, supporting staff as they campaign alongside residents to make biking safe and accessible for all. Give early for a better bike network.